Refraction is probably the most difficult to understand of all the altitude observation corrections. It is also the most difficult to estimate accurately because it depends so strongly on atmospheric conditions, particularly the rate of temperature variation with altitude (see lapse rate). I will derive in this post a commonly used expression for the refraction correction required for a celestial object with an altitude greater than or equal to 15°. The accuracy of this expression degrades significantly for objects below 15°. Formulas exist for refraction correction on objects with altitudes lower than 15°, but they are complex and are subject to substantial uncertainties. Since my goal here is provide some insight into how refraction is modeled, I will keep things simple and assume that we are working with objects relatively high in the sky. Refraction is the change in direction of propagation of a wave due to a change in its transmission medium (source). The index of refraction is a parameter that relates the speed of light in the material to the speed of light in a vacuum, i.e. , where c is the speed of light in a vacuum, n is the index of refraction, and v is the speed light in the material with index n. I discuss how the index of refraction varies with air's density in Appendix A. The angle of incidence is the angle between a ray incident on a surface and the line perpendicular to the surface at the point of incidence, called the normal (source). The angle formed by a refracted ray or wave and a line perpendicular to the refracting surface at the point of refraction (source). Figure 2 shows how we usually model refraction at the interface between two materials through which the light passes. Figure 2: Refraction Model (Wikipedia). Refraction effects are zero for celestial objects at our zenith and a maximum for objects on the horizon. Refraction causes celestial objects to have an apparent altitude that is higher than their true altitude. Thus, refraction corrections always involve subtracting a correction term from a measured altitude. 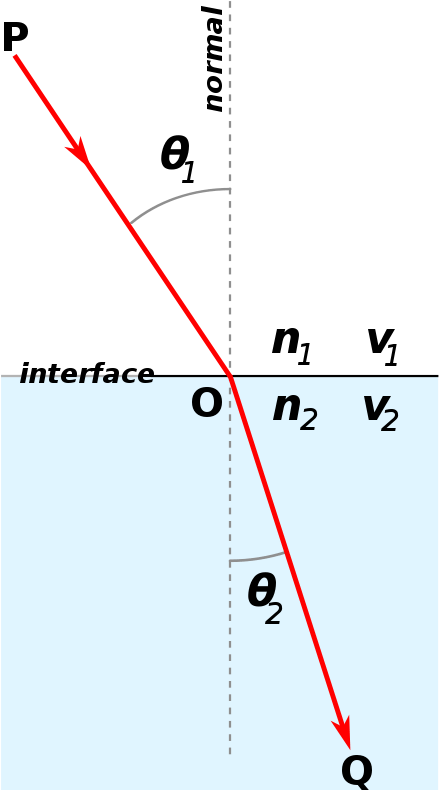 Snell's law relates the angle of incidence to the angle of refraction, which is usually expressed as shown in Equation 1.
θ1 is the light's angle of incidence. θ2 is the light's angle of refraction. v1 is the speed of light in material 1.
v2 is the speed of light in material 2.
n1 is the index of refraction of in material 1.
n2 is the index of refraction of in material 2. For celestial bodies with altitudes greater than 15°, we can model refraction with sufficient accuracy for navigational purposes by assuming that the atmosphere is series of flat layers with different densities. This assumption is not true for celestial objects with altitudes lower than 15° because the light from these objects will pass through atmospheric layers that are significantly curved. To keep this discussion simple, I will only model refraction for objects with altitudes greater than 15°. nAir is the index of refraction at the Earth's surface with a pressure of 760 mmHg and a temperature of 10 °C. It is usually assumed to have a mean value of 1.0002835. The reference temperature and pressure varies with the person doing the modeling. I often see 1010 millibars and 0 °C used as well. θ is the altitude of the celestial object. R is the angular measure of the amount of refraction. For a very detailed version of this discussion, see the excellent work in "Textbook on Spherical Astronomy" by Smart, which is my favorite text on the subject of astronomical measurements. Fortunately, this section of the text on refraction is available in its Google Books preview on page 58 (at least it was when I looked). 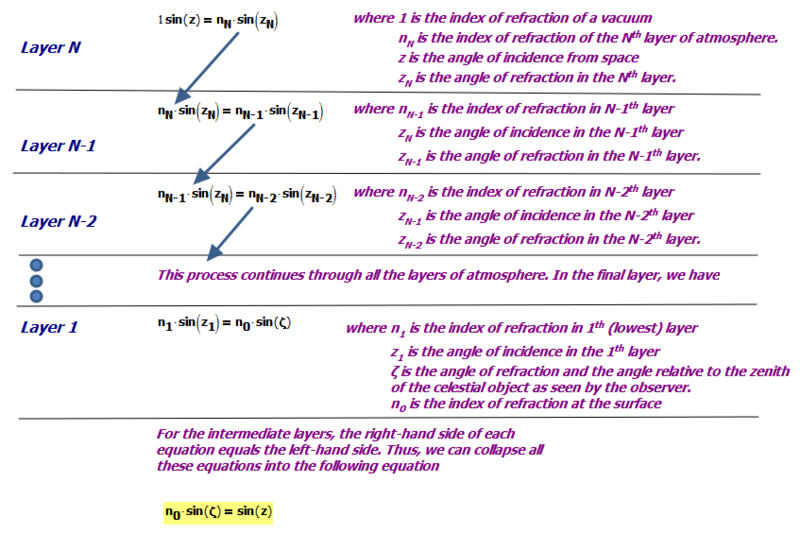 We begin deriving Equation 2 by assuming the atmosphere is composed of layers of air with different refractive indexes as shown in Figure 3. We can relate the angle of incidence in space (z) to the angle of incidence on the ground (ζ) using the argument shown in Figure 4. The idea here is is to look at the angles of incidence and refraction for each layer. As is shown in the Figure 4, all the intermediate indexes of refraction can be eliminated, leaving only the index of refraction of space (n = 1) and at the observer. The angles of incidence and refraction will be converted to altitudes in Figure 5. Figure 4: Key Relationship Between True and Observed Altitude. Given the relationship (yellow highlight) shown in Figure 4, we can now derive a commonly seen approximation for the refraction correction as a function of altitude (Figure 5). Figure 5: Derivation of Equation 2. 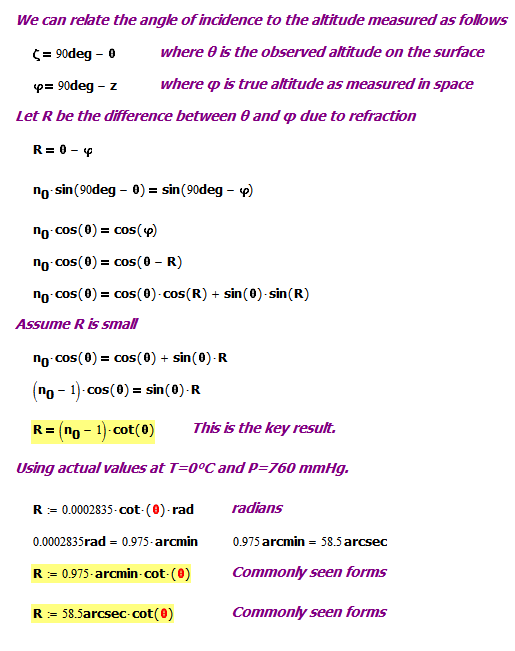 Figure 5 shows how to derive Equation 2 and presents it in the two forms that it is usually seen – one for arcminutes and the other for arcseconds. As an example of the use of these expressions, I am including a link to a surveying text that uses the arcsecond form. Equation 2 is a commonly seen expression for the effect of refraction on celestial objects with relatively high altitudes (>15°). We can correct a sextant reading for refraction by subtracting the value generated by Equation 2 from the altitude reading we obtained from our sextant. My next post will discuss index error, which is an error that is much simpler to describe than refraction. We need to have a model of the air's index of refraction in order to create an effective model refraction on sextant measurements. 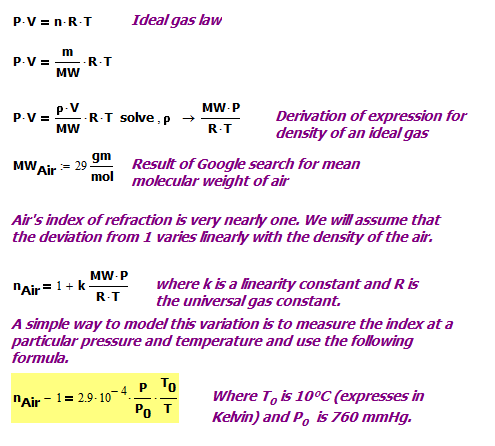 I will model the air's index of refraction using Equation 3. P0 at the reference pressure, which is assumed to be 760 mmHg. T0 is the reference temperature of T0 = 0°C. I see different references temperatures used. 2.9E-4 is the index of refraction air at a pressure of 760 mmHg and temperature of 0 °C. I show my derivation for Equation 3 in Figure 6. Figure 6: Air Index Linear Model Variation with Pressure and Temperature. 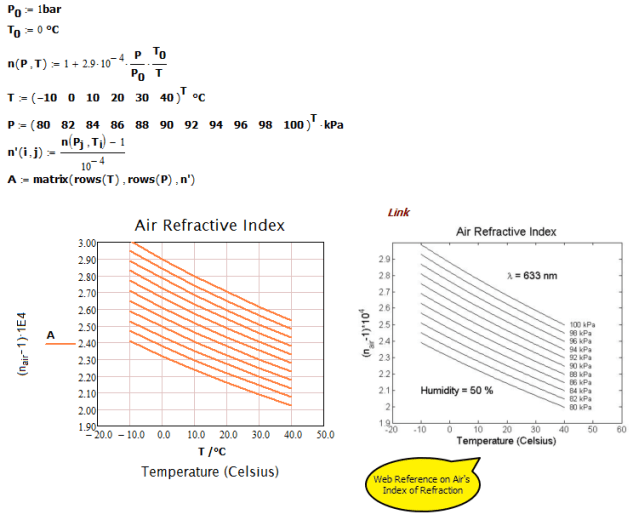 I can graph Equation 3 and compare it other models for air's index of refraction as shown in Figure 7. The agreement is good. Figure 7: Comparison of the Linear Model to Model Found on Web. This entry was posted in Astronomy, Naval History, Navigation. Bookmark the permalink. Let's assume that a position was measured by using 3 stars and they all agreed. Does it mean that a refraction error could be excluded? You can eliminate refraction by measuring the altitudes of three stars. In fact, the problem is known as Gauss' three altitude problem. It is one of the famous problems of navigation. I found a paper online that gives a reasonable solution (here). There are a number of free ebooks on Google books that cover the solution as well. These are old books, but charming in their own way. They also cover other methods that can be used to eliminate instrument error (e.g. two stars observed at the same altitude when time is known). This method is interesting because all you need is a clock to find your position.